HEROES, a Pop art exhibition with 5 artists, dedicated to their heroes, opening on 14 October, 5 -8 pm., the weekend before Amsterdam Dance Event, ADE. To coincide with the ADE, the Amsterdam Dance Event, the theme for the new show is DJ’s, music and their idols…..Heroes thus. A couple of the artists are DJ’s themselves, but all have a deep connection to the music industry. 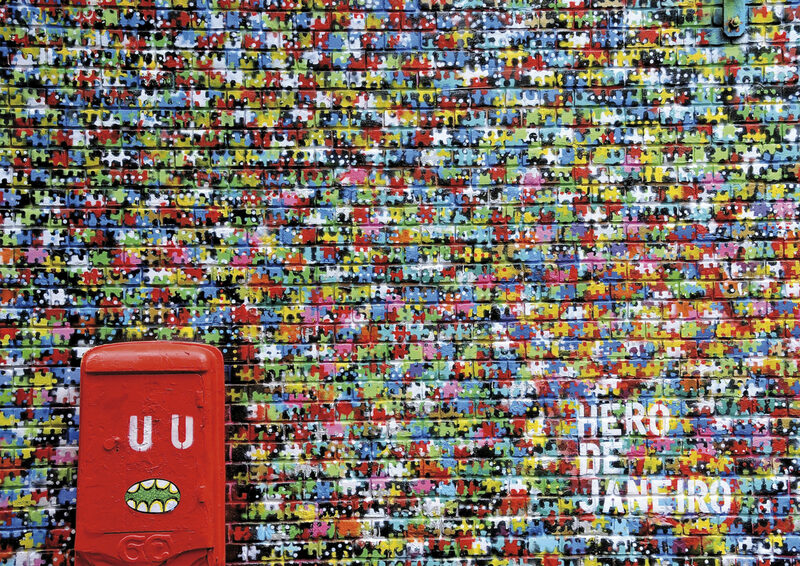 7 years ago, Herwin Bonardi, aka Hero De Janeiro began putting up life sized paste-ups all over Amsterdam. Karl Lagerfeld, Andy Warhol, Jip & Janneke carrying getto blasters. These were an instant success. The Wijdesteeg in the city centre of Amsterdam, a previously squatted spot, used to be Hero’s and Ottograph’s domain for many years. Ottograph being the one who gave him the Street-art bug. Since that time this area is a great tourist attraction. Recently Hero was asked by the city municipality to beautify the ugly plant bins into happy colourful art objects in this same area. 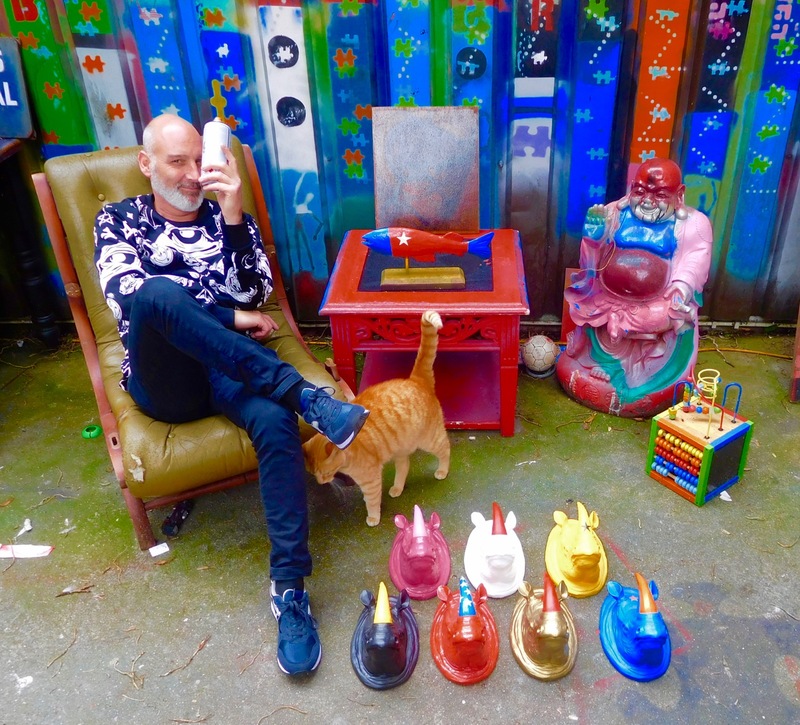 Hero at his studio, in front of his painted Rhino’s. a Belgian artist, got started in Venice CA, and then worked for 12 years in NYC made waves with his screen printed images of historic and contemporary icons and objects. “Disobedience, in the eyes of anyone who has read history, is man’s original virtue. It is through disobedience that progress has been made, through disobedience and through rebellion.” These words from Oscar Wilde describe the actions of my “heroes”. I have always admired those who will stand up and do what is necessary to make progress and change. Many of my subjects such as Joe Strummer, Brigitte Bardot, John Carlos/Tommy Smith, and … all represent this virtue. 4x BB by Daniel Dens, 81×81 cm, multy layered, screen painted on canvas, original. 2FasT is from Zagreb , Croatia and was one of the founding members of the Croatian graffiti movement in the 80’s. For the upcoming show 2Fast has created his “SPLASHES” with images of iconic objects and Icons, from the pop art world. Nick is inspired, mainly by music from the 60’s and 70’s, art from the 80’s and todays Street art. His style could be described as Neo-expressionist (street) pop. 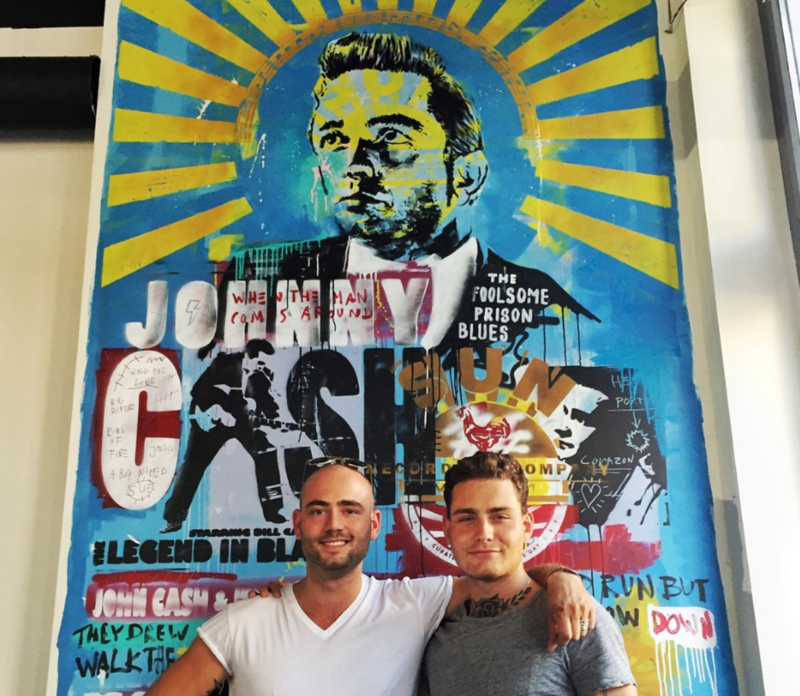 Nick Twaalfhoven designed Douwe Bob’s Fool Bar in Amsterdam. In the 80’s Peer used to be one for the first club DJ’s in Holland and played at festivals indoors and outdoors. In 2002 Peer decided to use his collection of albums in a very different manner. As artworks. He designed a special LP frame for this. He makes visual compositions with original LP covers from collectable artists. The original vinyl record comes with it, of course! Album covers designed by Andy Warhol. Brigitte Bardot by Daniel Dens, one of the icons of the “HEROES” exhibition.